Margery wins the PRWeek election! 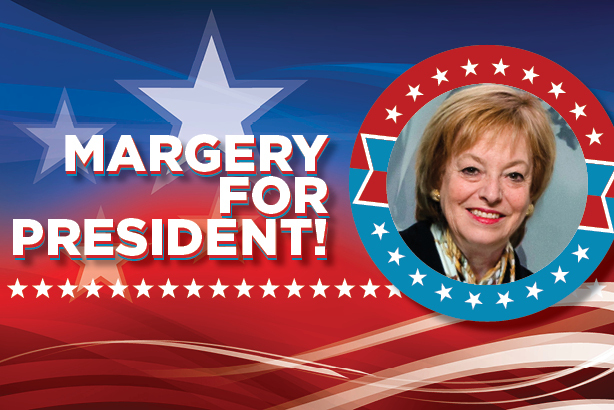 Your votes have been counted and APCO Worldwide's executive chair Margery Kraus grabbed the most votes at 1,158. Undoubtedly Kraus' decades of experience founding and running a global consulting firm specializing in public affairs and partnering with major multinationals resonated with voters. Multi-tasker, mentor, bridge-builder, and cool under pressure, Kraus' experience will serve her well should she ever decide to "officially" throw her hat in the ring. It is safe to say from the results she would have many people in her corner and ready to help shape her comms plan should she need it. Rounding out the top three were Omnicom's Karen van Bergen and Ketchum's Barri Rafferty. Thanks to everyone who cast more than 4,000 votes and all the nominees for indulging PRWeek in some light-hearted fun as we look ahead at the first possible U.S. female president in Hillary Clinton.